I am honoured to have been a part of this project. The visual project shows the power in connection and in sharing our stories. 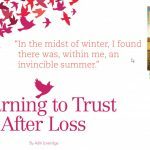 Having other women who can relate to your experience of loss is truly healing.